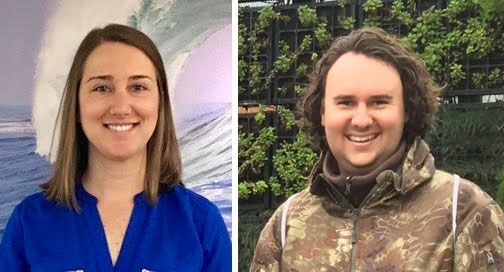 The Shorecrest Alumni Association is pleased to announce the election of Kara Earle ‘05, as its new President and David Huber ‘07, as its Vice President. The Shorecrest Alumni Association’s newly elected officers will start their 2-year terms on June 1, 2019. Earle and Huber, join fellow board members, Alexandria Crawford ‘12, Cory Gaffney ‘95, Pamela Greacen ‘84, Laurie Harris ‘82, Juliet Kyes ‘01, Chelsea Smith Scott ‘08, Brian Sotolongo ‘16, Laurie Slomka Reiskind ‘83, Beth Reynolds ‘84 and Jeff Ritch ‘01. The mission of the Shorecrest Alumni Association is to foster a mutually beneficial lifelong relationship between the school and its members, in an effort to inspire loyalty to, pride in, and support for Shorecrest from current and future alumni. The Alumni Association Board members work to engage alumni and students through a variety of outreach, programming, and volunteer opportunities. Shorecrest Alumni Association sponsored events include Homecoming Tailgate, Charger Hall of Fame, Alumni Distinguished Award, Career Day and the State of St. Pete. Visit www.shorecrest.org/alumni for more information about these events. The Shorecrest Alumni Association has also successfully implemented the Charger Challenge, an online giving platform to encourage alumni participation in the Shorecrest Annual Fund. The past two Charger Challenge initiatives helped to increase our alumni giving participation. The Alumni Association Board has several member-at-large positions available. If you are a passionate, service-oriented alumnus/a willing to commit your time and expertise to engaging alumni and students, please contact Stacy Alexander, Director of Alumni and Community Engagement at salexander@shorecrest.org! You don’t have to be local to St. Petersburg to serve, we will be adding a technology component for virtual meeting!